Have a question? Download our Frequently Asked Questions PDF. Is the air ambulance service licensed? Aircraft operators must hold a current Air Carrier Operating Certificate in accordance with Federal Aviation Regulations (FARs) regulated by the Federal Aviation Administration (FAA). The FAA governs the operation of the aircraft and installation of the stretcher and other equipment, but exercises no control over the medical aspects of the flight; including the medical team and the uninstalled medical equipment. Some states require licensure of air ambulances. These licenses are usually based on a variation of EMS standards and may not apply to fixed wing aircraft or long distance transports. Does the Air Ambulance service carry aircraft liability insurance and medical malpractice? For aircraft liability insurance, it is recommended that air ambulance operators carry a minimum of the following amounts for each aircraft: $5 million for twin engine aircraft; $10 million for turbo props; and $20 million for jets. Additionally, $1,000,000 in medical malpractice insurance is recommended. Are they willing to provide proof of insurance? Upon request, operators should provide the client with proof of insurance or a bond sufficient to meet the requirements of all United States agencies or foreign governments within their operation. Example: Aircraft Liability Insurance or Liability Insurance for country specific mandated coverage i.e. : Mexico, Canada, etc. Does any agency regulate the air ambulance industry nationwide? Currently, there are no mandatory regulations for air ambulance providers. The Commission of Accreditation of Medical Transport Systems (CAMTS) offers a voluntary evaluation of compliance with accreditation standards, which demonstrate the ability to deliver service of a specific quality. By participating in the voluntary accreditation process, services can verify their adherence to quality accreditation standards to themselves, their peers, medical professionals and to the general public. Is the actual air ambulance an operator or a broker? Again, aircraft operators must hold a current Air Carrier Operating Certificate in accordance with Federal Aviation Regulations (FARs) regulated by the Federal Aviation Administration (FAA). “Air ambulance brokers” refers to companies that broker transport for aircraft performing medical flights. Advertisements may imply that they own and operate medically equipped aircraft, but rarely do brokers own the aircraft or employ medical staff. They contract other providers—passing the costs, in addition to a broker fee to the customer. When a company’s status is questionable, inquire as to whether they hold an Air Carrier Operating Certificate. How can the broker’s price be less than a dedicated provider? By hiring providers that do not meet quality standards, regulatory requirements, and operate with minimal overhead, brokers can discount the costs. Always consider what the cost savings may have eliminated; such as, qualified and properly trained medical staff, high priced medical equipment, adequate aircraft liability and medical malpractice insurance. What is the expertise of the air ambulance service? A statement of past performance including the number of years the air ambulance company has been in operation as well as the flight experience in each region of operation should be made available to the client. Upon request the operator should also make available all records dealing with flight and medical personnel qualifications and training, aircraft maintenance and safety available to the client. Does the air ambulance service employ a Medical Director? All medical crews are required to practice under medical direction of a physician, referred to as the Medical Director. The Medical Director should be practiced in the care of a critical patient in the transport environment and must be knowledgeable of the effects of altitude physiology on varying patient conditions and diagnoses. Patient care or medical control may be directed by verbal order; or written, predefined standing orders. If necessary, the medical team should have some method to contact the medical director during flight. What are the training requirements for the air medical transport team? All medical staff must be appropriately licensed, age-specific Advance Cardiac Life Support (ACLS, PALS, NRP) certified and current in their specialty. All medical personnel must have training in altitude physiology, infection control, stress recognition and management, patient care capabilities and limitations during transport, aircraft safety and procedures, including depressurization. A minimum of two medical personnel should staff all air ambulance flights. Medical staffing for a transport should be made in conjunction with the client’s medical department; however, the final determination of an appropriate staff rests with the air ambulance provider. If the staff provided is not adequate for appropriate patient care the flight should not be conducted. Will the air ambulance service provide bedside-to-bedside care? When a program provides bedside-to-bedside service the transport medical team accepts the patient at bedside in the originating facility and delivers the patient to the bed of the receiving facility. Some companies may consider arranging for a local ground ambulance to bring the patient to the airport and another to take the patient from the airport to the receiving hospital as bedside-to-bedside. The level of care provided during this ground transport should not be less than that being provided during the flight. What are the costs of an air ambulance? Costs will vary depending on: type of aircraft, mileage, flight dispatching cost, medical staff required by the patient medical supplies, and ground ambulance charges. International and long-range domestic transports may by subject to additional costs such as: foreign ground handling fees and taxes, overseas air traffic control charges, over flight permits, crew overnight expenses, and relief pilot positioning via commercial airlines. The client should inquire as to what costs are included in the transport quote. Does the air ambulance service provide the required equipment and medications to conduct critical care transports? The medical oxygen range of the aircraft is especially important on long distance transports and the highest priority on over the ocean flights. Medical oxygen is not always available in foreign locations, or due to different standard connection fittings, may not be compatible with U.S. equipment. International medical aircraft should have an un-replenished oxygen supply on board to safely transport a ventilator dependent patient the entire transport, including fuel stops, and have a 25% reserve in case of unexpected delays. This standard can require 40-60 hours of medical oxygen to be available on the aircraft. A suctioning device should be part of the aircraft medical equipment as well as a portable device for use during the ground ambulance portion of the transport. All needed fluids and medications required by the patient during the transport should be provided, to include adequate surplus to accommodate potential flight delays. Fluids should be administered during the flight with the use of flight approved intravenous pumps to avoid fluid boluses that may result at altitude with physiological gas changes. Programs should develop diversion plans and procedures to accommodate all patient care needs in the event of unplanned lengthy delays. Will the proper aircraft be utilized and can the aircraft safely accommodate the patient? The “proper aircraft” should be determined by the mission requirements. Jets should be used for all transports exceeding 500 miles. For missions under 500 miles, a twin-engine pressurized aircraft flown by two pilots would be appropriate. FAA regulates the installation of the stretcher in regard to patient restraints and locking mechanisms; however, portable stretchers may be used that do not meet these specifications. Medical equipment and sufficient medical oxygen must also be evaluated. Is complete medical equipment provided during the transport? In addition to the medical equipment available on the aircraft, duplicate life support equipment should be carried for use during ground transports to and from the hospitals and as backup equipment on the aircraft during the flight. Programs should develop diversion plans and procedures to accommodate all patient care needs in the event of unplanned lengthy delays. Does the aircraft configuration allow for safe loading and unloading of the patient without excessive maneuvering and allow access to the patient by the med team during flight? Can definitive airway measures be performed without delay or constraints during flight? Configuration of the aircraft should not compromise the ability to provide appropriate care or prevent providers from performing emergency procedures if necessary. Can definitive airway measures be performed without delay or constraints during flight? Medical transport personnel must have access to the patient in order to begin and maintain basic and advanced life support treatment. What documentation with the transport should you expect to receive? The client should be provided an itinerary prior to departure and timely updates, including patient status reports, during the flight. Upon request and with proper authorization, the medical record should also be provided. AirMed holds a current Air Carrier Operating Certificate in accordance with Federal Aviation Regulations which are in compliance with the Federal Aviation Administration regulations. AirMed also is in compliance with licensure requirements to complete transports in all 50 of the United States. 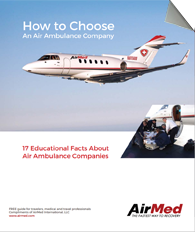 AirMed provides the recommended amount of aircraft liability insurance which is $20 million for jets as well as professional liability in the amount of $15 million. We also provide a level of medical malpractice insurance that exceeds the recommended standards. Proof of liability and medical malpractice insurance is readily available upon the request of the customer. The air ambulance industry has a voluntary accreditation process through the Commission of Accreditation of Medical Transport Systems (CAMTS). AirMed holds accreditation from CAMTS as well as the European Aeromedical Institute (EURAMI) proving our dedication to providing the highest standards of quality patient care in the transport environment. AirMed is an aircraft operator in which we own and operate the aircraft as well as employ the medical staffing for the missions in which we are contacted to provide. AirMed holds a current Air Carrier Certificate with approved air ambulance operations specifications in accordance to Federal Aviation Regulations regulated by the Federal Aviation Administration. AirMed prides itself on having the highest standards of care in regards to medical staffing, medical equipment, aircraft liability and malpractice insurance. When looking at the price difference of brokers and operators, consider the quality of care for which you are paying. AirMed has provided care to the ill and injured for three decades. With the number of missions reaching over 18,000 to more than150 destinations, proves the level of commitment that AirMed has to the Air Medical industry. Our fleet is used exclusively for air medical transport so that we provide the safest, highest quality of care to our clients in their time of need. AirMed has a Medical Director that is available 24 hours a day, 7 days a week, and 365 days per year. The medical crews function under the direction of verbal, written and standing protocols. If medical direction is needed during a flight, the physician is available by satellite phone capabilities. Our Medical Director(s) are trained in Critical Care with emphasis in transport medicine and altitude physiology. AirMed’s medical staff must hold licensure appropriate to the job in which they function (MD, CRNP, RN, RT, and EMT-P). All staff must also hold current certifications in Advanced Life Support appropriate to specific age categories (ACLS, PALS, and NRP), Trauma specific certifications (TNCC, TNATC) as well as Specialty certifications such as CCRN, CFRN and FP-C. Quarterly training is provided to keep the crews up to date on advanced airway management, Crew resource management, aircraft safety training and altitude physiology. AirMed desires to transport a patient bedside-to-bedside. There are instances in which that is not an available option. In these cases, the care that the patient receives once they are released from the care of the AirMed team should not be less than that provided by our medical crews. Our goal is to provide the patient with a continuum of care that meets the highest standards by which we operate. AirMed makes every effort to make sure that amission is oerformed in the most efficient manner. By having our own FAA flight dispatchers located in our corporate office, we are able to perform flight planning in the most safe and efficient manner. Costs will vary depending on: type of aircraft, mileage, flight dispatching cost, medical staff required by the patient medical supplies, and ground ambulance charges. International and long-range domestic transports may by subject to additional costs such as: foreign ground handling fees and taxes, overseas air traffic control charges, over flight permits, crew overnight expenses, and relief pilot positioning via commercial airlines. AirMed’s Clinical Coordination team, flight and medical staff determine the safest and appropriate aircraft to be used for a mission. All aircraft utilized by AirMed are equipped to provide the same level of care whether it is for 500 miles or 10,000 miles. All AirMed aircraft are equipped with the equipment to care for a patient from the time patient care is assumed until care is transferred at the patient’s destination. Back-up equipment is available in the case of equipment failure. Diversion plans are in place around the world in the case that a patient’s status changes, requiring additional resources. Does the aircraft configuration allow for safe loading and unloading of the patient without excessive maneuvering and allow access to the patient by the med team during flight? All AirMed aircraft are configured so that patient loading and unloading can ber performed without the need to excessively maneuver the patient. The placement of the patient on the aircraft provides constant access and monitoring capabilities by the medical crews. AirMed’s aircraft are configured so that the patient’s safety and health are the priority. Medical crews have continuous access to the patient so that Advanced Life Support and procedures can be carried out, without delay. AirMed’s Medical Communication Center is staffed 24 hours a day, 7 days a week, 365 days per year. Our representatives are able to provide real-time updates to the client. From the initial itinerary for the mission to the status reports provided during the flight the customer is provided timely and transparent information from our Communication Center representatives. Once a transport is completed, the medical record will be available to the client within a timely manner if requested and accompanied by the appropriate authorization. We maintain compliance with HIPPA guidelines and the client’s privacy is at the forefront of concern for us. Are AirMed's Services Covered by Insurance? Most insurance plans, HMO's, PPO's, and IPO's, appreciate and cover air ambulance services. However, it's important to check your plan to see that there is an air ambulance benefit and ensure that you meet your provider's eligibility criteria. Realizing that this can be an inconvenience, AirMed staffs full time specialists that will assist with insurance pre-authorization and payment options. Please inquire today at 205-443-4840 or toll free at 800-356-2161 and a specialist will be happy to help you.